to manage it through diet modification. That means really watching salt intake. 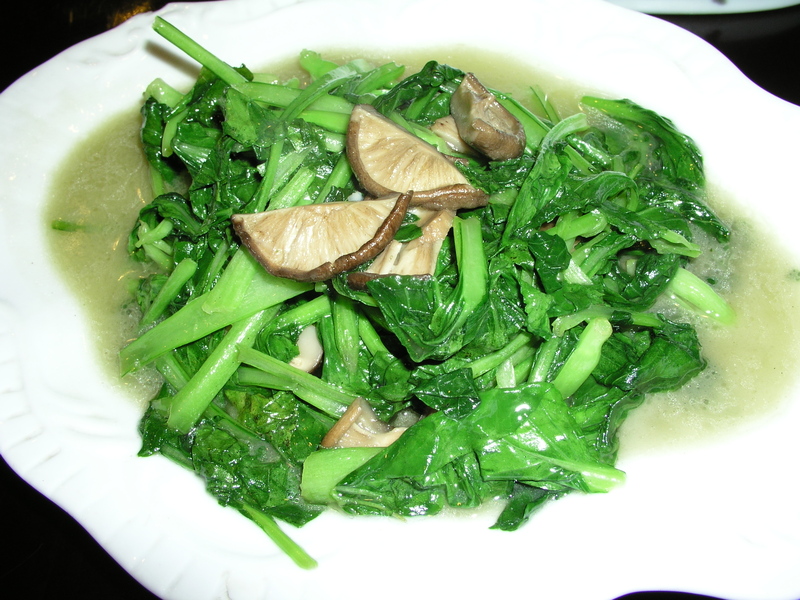 sodium in Sichuan and Hunan cuisine. Thanks for writing to me, Tom! This is actually quite a common question about soy sauce and Chinese cuisine in general. I think the important thing to remember is that salty and strongly-flavoured dishes are used in China to ‘send the rice down’ 下饭 – which is to say that they are normally eaten with quite a lot of unsalted (and usually completely unseasoned) rice, noodles or bread. 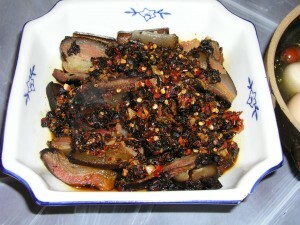 So although a dish or a relish in itself may be salty, it is actually eaten in fairly modest quantities. 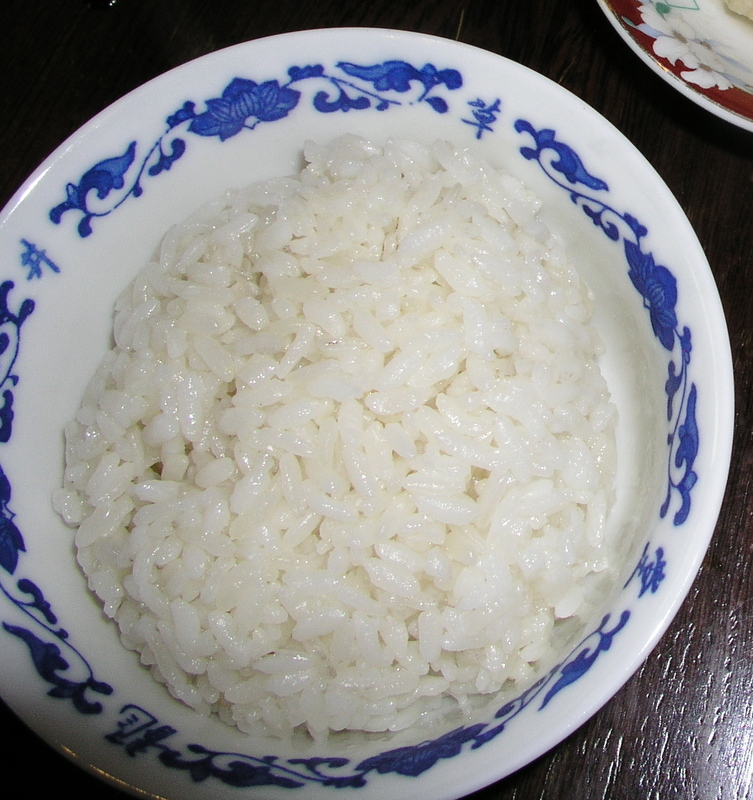 rice (brown rice if you want to be really healthy – I often do this when cooking at home), and one or two very lightly-salted stir-fried vegetables. You can also remember that Chinese dumplings are often dipped in vinegar rather than soy sauce (Chinkiang vinegar is very good for this), and that Chinese people traditionally eat far more fan 饭 (rice or other staple grain food) than cai 菜 (accompanying dishes). So if you eat in the Chinese way, a dish like General Tso’s chicken, served with some simple vegetables and rice, can be shared by 4-5 people – which means that the salt will be spread very thinly around! 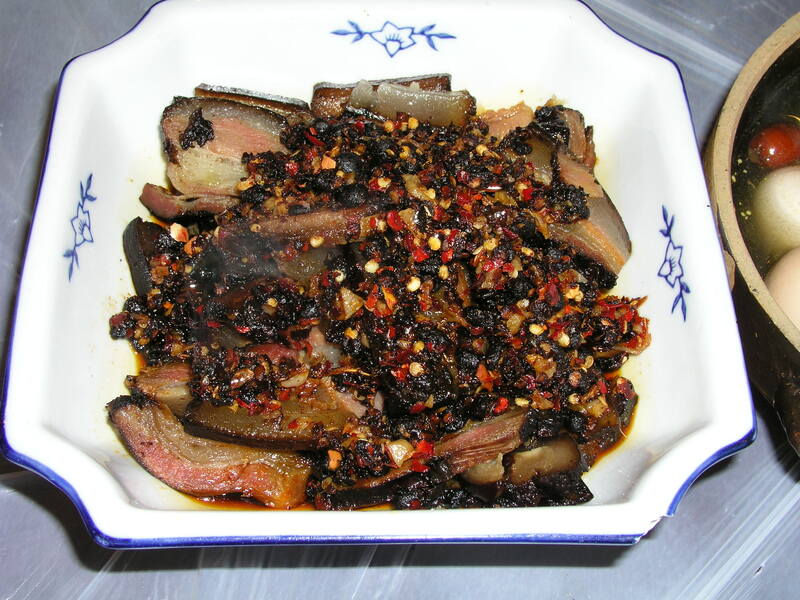 Do also make sure you rinse your fermented, salted black soy beans and salty preserved vegetables before using them in dishes like twice-cooked pork and dry-fried beans, since they can carry a lot of excess salt. Personally, I prefer to adjust my salt intake in these ways, rather than buying ‘low-sodium’ products, just as I prefer to eat a little bit of rich and glorious real butter to some synthetic ‘low-fat’ spread. I do hope this is helpful. Any blog readers have any other suggestions? It may be helpful to look around and read the labels on a few soy sauce products, e.g i use Pearl River Bridge Golden Label Superior Light Soy Sauce which is said to have 900 mg sodium in one tablespoon ( 36 % of recommended daily intake) . This is not low by any means but it is much lower than 1600. The Pearl river product is labelled as naturally brewed and is not a ” low-sodium” product. Next time i’m in the Chinese supermarket i’ll have a look at other soy sauce products and their sodium content. I did check my bottle of dark soy from Pearl river and that had about the same amount of sodium as the light soy. That’s interesting (this is Tom, who wrote the initial letter). I use Pearl River Bridge Superior Light Soy Sauce, and the label reads 1590mg/tbsp. I’m not aware of the ‘Golden Label’ product–mine has a yellow label, I buy it in 1.8L bottles (very economical! )–but I’ll look for it. Sodium is used in the greatest quantities as a preservative in processed foods, in forms that don’t generally contribute a salty flavour. This is the stuff you want to avoid, and is by far the largest source of sodium in the diet (seventy-five to ninety-percent of salt intake). You’re going to be best off avoiding things like packaged bread, canned foods, tomato sauce. The salt that you do use to flavour food is relatively inconsequential: as long as you keep away from processed things it should be practically impossible to add enough salt to your food for flavour for the amount to be harmful. Tom-i checked a 500 ml bottle of Pearl River Superior Light Soy Sauce and the sodium content was given as 870 mg/tablespoon- not sure why the difference with your larger size. I guess another way to see this is not to worry so much about the sodium content, which, abstracted as absolute values, seem shockingly high, but which probably are harmless in the larger context of a diet that is rich in foods that are known to counteract hypertension, e.g. green tea, bitter melon, and the wonderful kudingcha, which is so beloved in Sichuan and Yunnan. The best naturally brewed soy sauce from whole soybeans comes from Taiwan. The Kim Ve Wang brand soy sauce is all natural, and is 560 mg. salt for 2 tsp. And the flavor is great! Another great brand from Taiwan is Wuan Chuang Black Bean Soy Sauce. This is a very old brand in Taiwan, it’s made from black soybeans and ricem and is 398 mg. of salt for 2 tsp. This is a dipping only soy sauce, and it is thick, a little less than molasses. Both these brands have no preservatives, no MSG, and are made from whole soybeans. Once opened, you have to refrigerate them or they will spoil. Once opened, you should use within 3 years. Ching-He Huang would definitely know these brands. Maybe someone could convince her to import these brands into the UK.